It's my last day in Athens and I don't want to do anything too strenuous ahead of a blitz through Peloponnese. So it's another day trip. 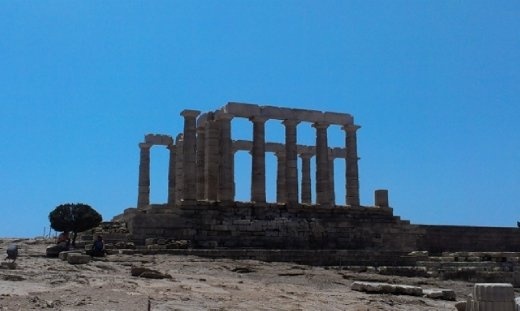 This time to Port Sounoin to see the Temple of Poseidon. Actually, I suspect it's only going to be a halfway trip, which is perfect. There are plenty of buses from Athens going to Sounion because I guess, there's plenty of beaches on the way. I took a bus from a terminal station near Monastiraki Metro station. This option is the longer coastal, but scenic route and takes about 1.5 to 2 hours. Apart from beaches and resorts in the surrounding areas, there's only a cafe at the site selling food and drinks at extortionate prices.